Sweet, isn’t it? Lucia Salemi is an artist who creates beautifully colourful and whimsical works that drip with pleasure and joy. 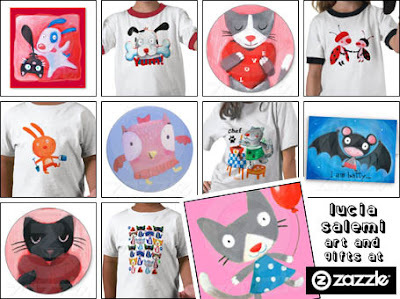 And at her Zazzle shop you can pick up these beautiful works on posters, cards, buttons, stickers, t-shirts, hats, and much, much more besides. So now, if you’re ever looking for a joy filled gift to brighten up someone’s day, you’ll know where to go, wont you? Enjoy yourselves! Adorable Mascot,what a cute post :)))TY so much for the feature, I really appreciate it! Keep Cool with Frosty Pops! Moshi Monsters Mash Up Cards!